At Barclay Suites, we want to make it easy and convenient to reach us from the moment you get off a plane or bus or from when you get in your car. When arriving by car you can use the short-term parking right outside the Barclay’s front door when checking in and unloading luggage. Just a note to check the Getting Here Map, as parts of Albert St will be closed from time to time with CRL work. See the CRL Info page for more information. If you are walking from the Skybus or Britomart, the Barclay Walking map shows the best route to use while parts of Albert St are closed. Reaching Barclay Suites central city apartment accommodation takes about 30 - 40 minutes, depending on the time of day, from the airport. once you’re in your car you can follow our Barclay Getting Here map, which should hopefully make getting to our central city apartment accommodation as easy as possible. show the driver the Barclay Getting Here Map for the best route to take given Albert St closures. Barclay Suites is a 30 - 40 minute drive or taxi ride depending on the time of day which should cost around $85 - $100. Just a note that NZ taxis charge by time and distance, so the fare could vary based on the part of the day you arrive. Your driver should be able to give you an idea of how much it will cost. If you want extra reassurance you may want to have the Barclay Getting Here Map on hand for your trip. Door to door Airport Shuttles are available from both the international and domestic terminals. These shuttles may have a number of drop offs before they reach Barclay Suites. 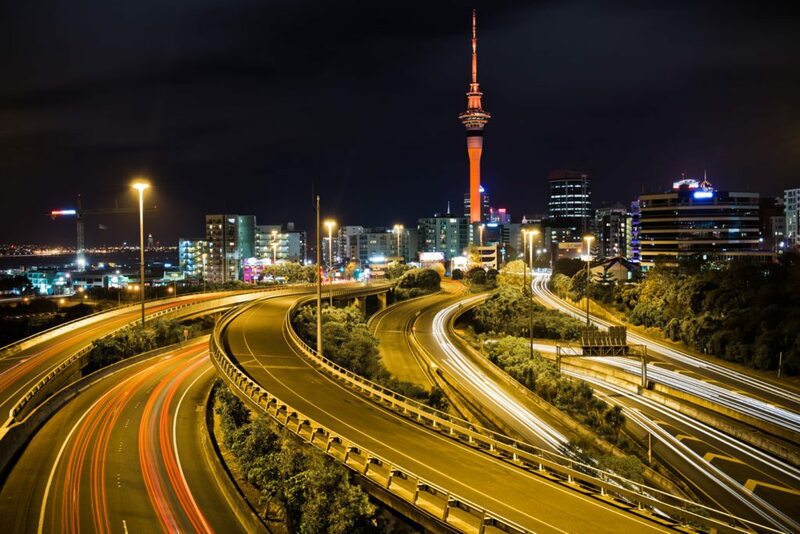 Follow airport signage to the shuttle areas and let the driver know how many of you there are and that you would like to go to Barclay Suites at 74 Albert St, Central Auckland. With Albert St closures you may want to have the Barclay Getting Here Map on hand for your trip. Services should cost around $35 for an adult and there may be lower fares for children and additional adults. 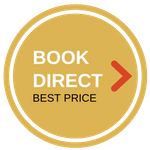 Another way to get to Barclay Suites central city apartment accommodation is the Airport Sky Bus which costs a maximum of $16 one way. You can catch the SkyBus to the airport too. 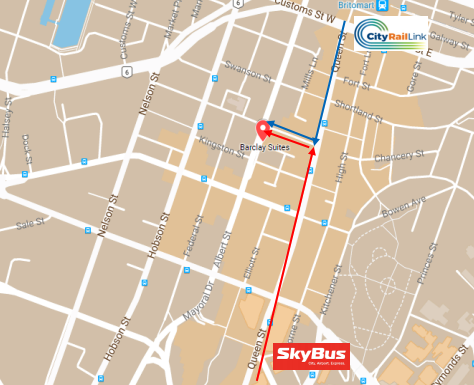 The SkyBus departs from both the International and Domestic terminals before continuing midway up Queen St. You can either taxi or walk to Barclay Suites from there or change to another shuttle bus and continue down Queen St to Britomart and taxi or walk from there. From either point the walk will be about 10 - 15 minutes or a short taxi ride. For the SkyBus airport stops, prices, time tables and pre-booking click here for the SkyBus Site.